Can the CMB Alone Provide Evidence for Dark Energy? Authors: Blake D. Sherwin et al. Continuing with Monday’s theme of cosmology, today’s astrobite features an ApJ Letter that describes new evidence for dark energy. In the past decade a number of cosmological tests have been developed that show a need for a cosmological constant that we have dubbed dark energy. All of these tests involve combining data from the Cosmic Microwave Background (CMB) with a low-redshift observation such as galaxy cluster abundances, supernova measurements of the redshift-distance relation, or measurements of the Hubble constant (the expansion rate of the universe). The authors of this paper, however, have demonstrated that the need for dark energy can be shown from observations of the CMB alone. The top panel shows the CMB power spectrum, with two indistinguishable models fit to it. 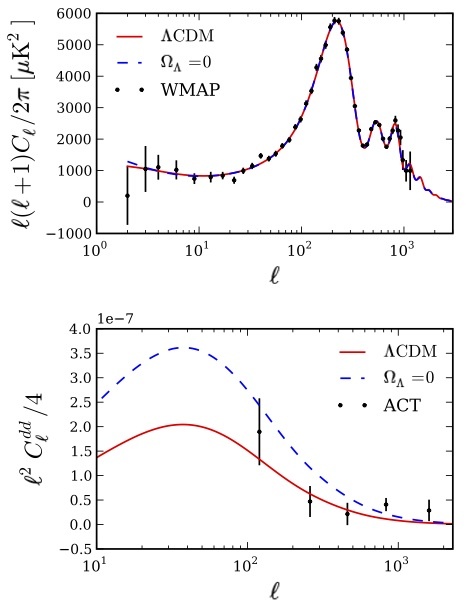 The bottom panel shows the effects of including the ACT lensing data, which allows the authors to state that the model with dark energy is a better fit. In this paper, the authors want to use only the CMB to constrain the parameters and . 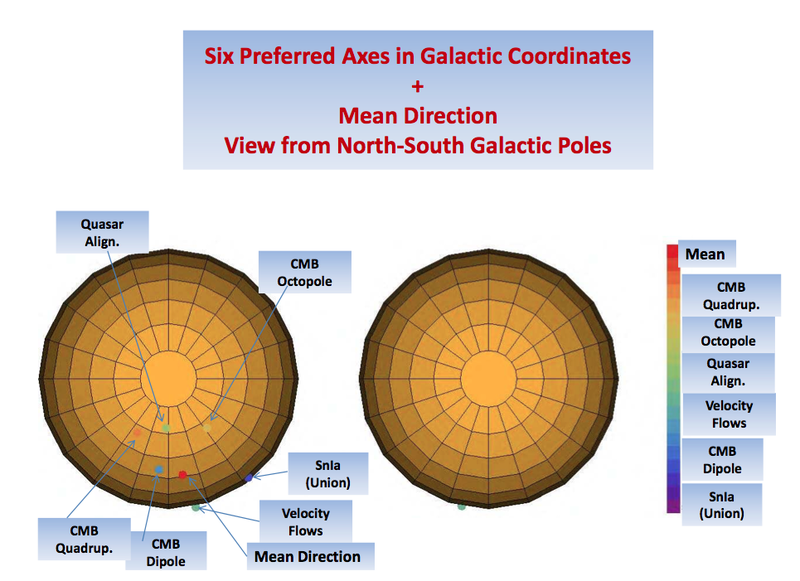 When using the CMB to constrain cosmology, astronomers often start with its power spectrum, which describes the power in the CMB on various angular scales. (Nathan discussed the power spectrum of the Lyman-α forest on Monday – clearly power spectra are an important cosmological tool!) The CMB power spectrum is shown in the top panel of the figure at right. Angular scales are shown on the x-axis in units of the multipoles, with low values of l corresponding to large scales on the sky. 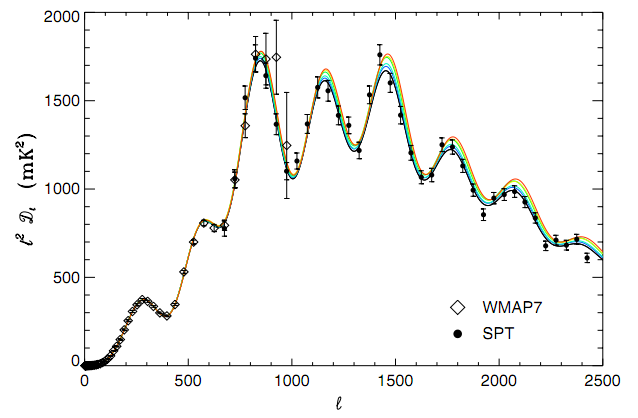 As the top panel shows, using just the data from WMAP (the satellite that is taking measurements of the CMB), one cannot distinguish between and a cosmological model with no dark energy ( ). So how can the authors use the CMB alone to constrain dark energy? This is where the Atacama Cosmology Telescope (ACT) comes in. The ACT project observes the CMB at very high resolution, and is able to break the “geometric degeneracy” between curvature and dark energy by studying the effects of gravity on the CMB photons. As the photons of the CMB travel through space towards us, they are deflected on arcminute scales due to gravitational lensing by large scale structure in the universe. When measured carefully, this effect gives the authors the low-redshift information that, when added to the total CMB power spectrum, allows them to distinguish between a model with dark energy and one without. The bottom panel of this first figure shows the difference in the two models, which is clearly visible when the lensing information is added. 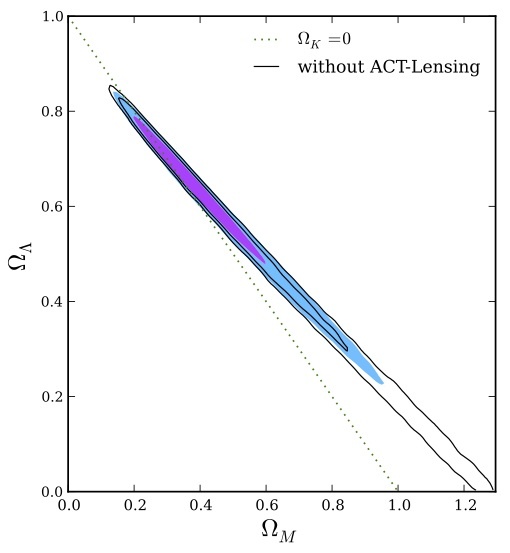 This figure shows the new constraints on the values of dark energy and matter density provided by the ACT CMB weak lensing data. As shown by the colored contours, a model without dark energy is ruled out at the 3.2 sigma level. The paper’s result is shown perhaps most clearly in the figure at left. This plot shows the value of on the x-axis, and on the y-axis. The dotted line shows the values for a flat universe, in which the two constants must add up to 1. Without ACT-lensing, the CMB provides the constraints shown by the solid contours – at the 2 level, these contours go all the way down to , so a cosmological model with no dark energy cannot be ruled out. The colored contours show the effect of including the ACT lensing data – at the 2- level, it is no longer possible to have a model with . (In fact, the paper says such a model is ruled out at the 3.2 level.) In addition, the authors’ results for the best values of and agree nicely with the results from the other cosmological tests that have been performed. As the ACT telescope continues to take data, the authors hope to improve these constraints.